Diabetes type 2 is the very common type of diabetes and affects people across all ages and ethnic groups. It is a chronic disease characterized by high levels of sugar in the blood. Here, we are going to take a look at what are the causes, symptoms and treatments of this type of diabetes in detail. 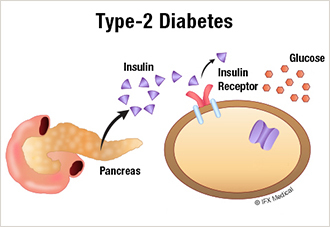 The type 2 diabetes mainly occurs due to the reaction of body in producing and utilizing insulin. This hormone is required to move the glucose into cells. 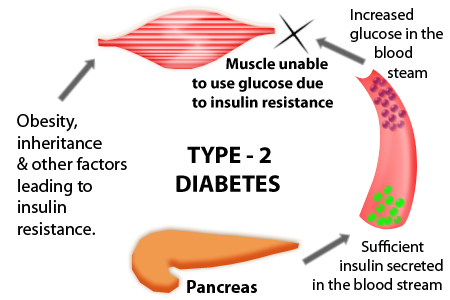 However, in case of a man or a woman suffering from diabetes type 2, the body doesn't respond to insulin. In short, there is an insulin resistance, which means that the liver muscles and fats don’t respond in a normal way to insulin. 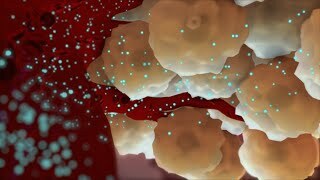 Because of this, the glucose does not get stored in the cells for energy. As a result, it enters the blood in larger quantities which creates an imbalance of sugar in the system. This condition is known as hyperglycemia. Being overweight is one of the big reasons for this type of diabetes. In case of a person displaying symptoms of excessive weight, there is large amount of fat present in the body and that interferes with the normal creation of insulin by the body. Family history as well as genetics can also lead to diabetes type 2, as well as poor diet and low physical activity levels. Hemoglobin A1C test: This test is one of the best to identify whether a person is at the prediabetes stage. Oral Glucose Tolerance test: This is one of the most glucose tolerant tests, which takes up to 3 hours. For this test, a person with diabetes symptoms is asked to drink a liquid containing glucose and their blood is then tested after every 30-60 minutes. If the glucose level comes to a high of 200 mg/dl after two hours, then the person is said to have developed type 2 diabetes. The main objective of treatment of diabetes is to lower the levels of sugar levels in the blood. If you were experiencing type 2 diabetes symptoms and are consequently diagnosed with this type of diabetes, then it is essential to exercise on a daily basis and follow a proper diet. Exercising regularly is vital for people suffering from type 2 diabetes. This is because exercising helps to lower the levels of sugar in the blood without the need to take medications. In addition to that, exercising on a regular basis also burns the excess fats and calories and helps to maintain normal weight. A person suffering from diabetes needs to follow a proper diet that is low in fat and calories and rich in fiber content. A good diabetes diet contains good amount of complex carbohydrates such as beans, whole grains and others. A diabetes diet should also include good amount of vegetarian food cooked in olive or coconut oil. It is important to remember that diabetes type 2 is a chronic illness and can create many other complications. It is advisable for you to take necessary steps and visit a physician to keep your diabetes under control.